In September of 1999 my wife and I decided to buy a home outside the city and move out into the county where we could have a larger lot providing more space between us and the neighbors yet stay close enough to town so the commute wouldn’t be so costly. Upon purchasing the home we felt like we were covering all of our bases. The home inspector had brought to our attention that the county will be contacting us regarding the septic system and that we should consider acquiring an Inspection Service Contract. I thought, “I’m a do-it-yourselfer, I’ll handle the service” – but this wasn’t the case. Once we were in the home and were settling in we received a notice from the Brazos County Health Department, living up to the inspectors warning, we needed an inspection service contract. Needless to say after about 3 months of frustration I ended up paying someone for a service contract and the county was happy for the next year. During that year I saw no signs of anyone being on my property other than the water & electrical meter readers. I know this because we have some not so friendly dogs in the back yard where everything is located and the meter readers let us know so we worked out a schedule to keep the dogs contained. The septic man never said a word. The next year I got a reminder letter from the Health Dept. and this time I was a little more apprehensive. I went and visited the Health Department because I felt I had been wronged. I found out I had been wronged and it was up to me to do something about it. I elected not to pursue legal action but wanted to work with the Health Department to get this guy to do right. Another year went by and the same thing, nothing. It was quite clear I was literally paying for a piece of paper to keep the county happy, at least that is the way I felt. At this point I refused to do this again and I was told I had two options. One was to face a judge and the second was to get a license and get certified by the manufacturer of my aerobic septic system in order to do the service myself. After acquiring the proper credentials friends started encouraging me to start a business and help others in the same predicament I was in. My wife and I thought about it for a while and thought “hey, we can do this”. 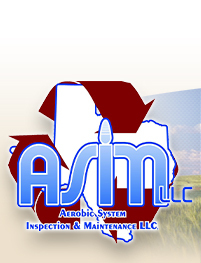 In February 2002 Aerobic System Inspection & Maintenance was born. We drafted a contract and signed up our first customer. Our goal is to provide a service second to none by fulfilling the obligations of our contract statement and providing more than a simple inspection.